Logroño’s calle Laurel is a required stop for both visitors and locals in search of tasty tapas and rioja. Nowadays, most of the bars have adapted their range of tapas to a more modern, elaborate style because of the influence of the bars in San Sebastian’s old town, but a few places here continue to offer tapas that have been popular for fifty years or more, using local raw materials or canned fish, prepared simply and cheaply. These bars are among the favorites of older natives of the region. You should try them, too. Calle Laurel wasn’t always a street full of bars and restaurants. In fact, it used to be one of Logroño’s red light districts. Local folklore says that the prostitutes used to hang a branch of bay leaves (‘laurel’ in Spanish) on their balcony to show prospective customers that they were free. The tradition of bars started when someone decided to open a bar where people could keep warm and have a drink while waiting for their favorite lady. Bar Soriano, Travesía de Laurel 2. Closed Wednesdays and during the San Mateo wine harvest festival. Bar Soriano is unquestionably the most popular bar in the old town. According to José María Barrero, who’s in charge of the griddle, they serve over 7000 mushroom tapas a week. They source their mushrooms in Pradejón in Rioja Baja. Their sauce is a closely guarded secret but my wife thinks that it’s made from olive oil, garlic and lemon juice that’s blended into a thin sauce. It sounds easy to make, but several local competitors can’t come close to matching it. The mushrooms are cooked in a little olive oil with salt on a very hot griddle. Just before they’re done, some sauce is sprinkled on top of the mushrooms. They are speared three at a time with a toothpick topped with a small piece of shrimp and put on a slice of bread. Bar Sierra La Hez, Travesía de Laurel, 1. What does this tapa, made with olives, hot green peppers and a salted anchovy have to do with Rita Hayworth? According to the Basque Gastronomic Academy website, this tapa was invented in 1946 in the Bar Vallés in San Sebastian, whose owner called it a ‘gilda’ because, like Rita Hayworth it was “salada”, verde y un poco picante”, literally, “salty, green and a little spicy” which aptly describes its appearance and taste but with a second meaning: “lively, uses salty language and a little provocative”. In any case, it’s delicious. Sierra La Hez is also a great place to listen to Spanish music from the 70s and 80s and if you speak Spanish, owner Miguel Ruiz is a walking encyclopedia of this genre. La Taberna del Laurel, calle Laurel 7. This is the perfect first stop when embarking on an evening in calle Laurel because the potatoes act as a barrier against the absorption of wine, beer or whatever you’re drinking. It’s always packed but you can hear the guy behind the bar yell “¡Una de bravas!” (An order of bravas) from the street outside. Classic recipes for patatas bravas use only the spicy red sauce but the Taberna del Laurel, red sauce and a mayonnaise-like sauce to the red sauce. You can find the recipe at the end of this post. El Soldado de Tudelilla, calle San Agustín 33. It’s easy to make. Manolo, the owner of the bar, takes a piece of bread, slices it in half lengthwise, opens a can of sardines in olive oil and a can of spicy green peppers in olive oil, puts half a sardine and a pepper on the bread, and wraps it in a paper napkin. It tastes delicious with a glass of young red rioja. If you want to know what bars were like 50 years ago, this is the place. It features a zinc bar and a huge sink where tomatoes float and bottles of wine are chilling. The wall behind the bar is covered with old bottles of rioja, some of whose labels are collectors’ items. Bar Achuri, Calle Laurel, 11. If you’re looking for traditional tapas, look no further, so forget about being squeamish and dive in. Among the delicacies on offer here in addition to cod are embuchados (fried sheeps’ intestines), fried pigs’ ears and roast cloves of garlic in rioja wine vinegar. YUM! No kidding! These bars are also places where customers can enjoy words of wisdom as they eat and drink. Here are some examples. According to the directoalpaladar website, the red sauce isn’t tomato-based but rather a roux (slowly fried onions, sweet and spicy paprika and flour), to which you add chicken stock until creamy, then mix in a blender. three medium potatoes cut into bite-sized pieces, three tablespoons of sauce (see below), extra virgin olive oil, salt and a little parsley for decoration. To make the sauce: ½ onion, ½ tablespoon of sweet paprika, one tablespoon of spicy paprika, two tablespoons of flour and ½ liter of chicken stock. Chop the onion and slowly fry in a little olive oil. Before the onion browns, add the sweet and spicy paprika, mixing them with a wooden spoon. Add the flour, fry it for a minute it or two and when the mixture starts to blend with the olive oil making a roux, add the chicken stock little by little to make a creamy sauce. Simmer for ten minutes so that the paprika and flour are cooked through, mix it in a blender and then strain. If you’re in a hurry or not an especially accomplished chef (making a good roux takes time), I suppose you could make a thick tomato sauce and add Tabasco, but that’s cheating! To cook the potatoes, there’s more than one option, like most things Spanish. Some recipes recommend just frying the pieces of potato while others suggest first boiling them for two minutes and then deep frying them. Making a statement like that is Oscar Tobía’s style and in keeping with his role as Rioja’s greatest winemaking innovator. It’s a powerful statement in a region where innovation is everywhere, an indispensible requirement for success in an extremely competitive marketplace. 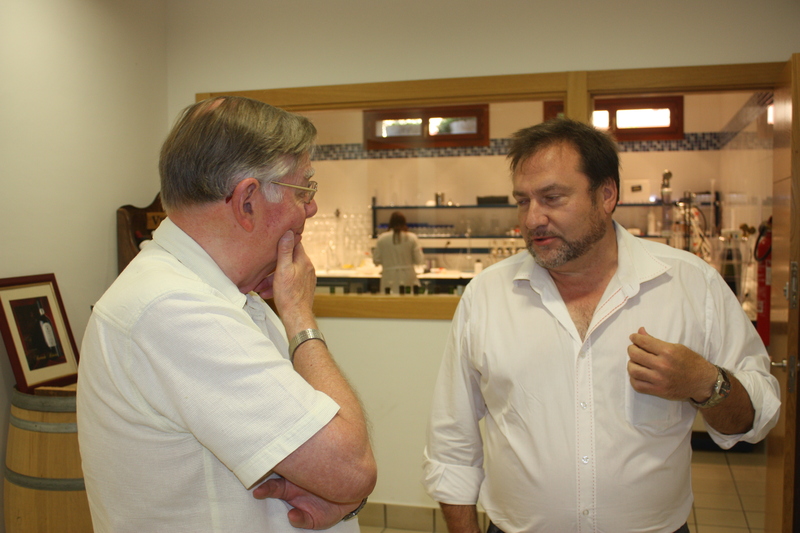 My friend Jeremy Watson, former director of Wines from Spain in the UK and author of two highly regarded books about Spanish wines, recently expressed an interest in visiting Bodegas Tobía after hearing interesting things about the winery. He asked me to set up the visit and I duly complied. Oscar enjoys pushing the envelope. He made Rioja’s first barrel fermented rosé but wasn’t allowed to sell it because the technique wasn’t in the Rioja rulebook, but he insisted, won the support of other winemakers and was finally successful in getting the rules changed. Oscar led us outside to his fermentation tanks, where we saw the first evidence of his commitment to innovation: the exclusive use of Ganimede fermenters from Italy that store and release the CO2 produced during fermentation to constantly mix the grapeskins and the fermenting juice, avoiding the formation of a cap. Oscar says it’s a totally natural process and saves on the cost of traditional methods of mixing the skins and the juice such as delestage, pumping over or pigeage. 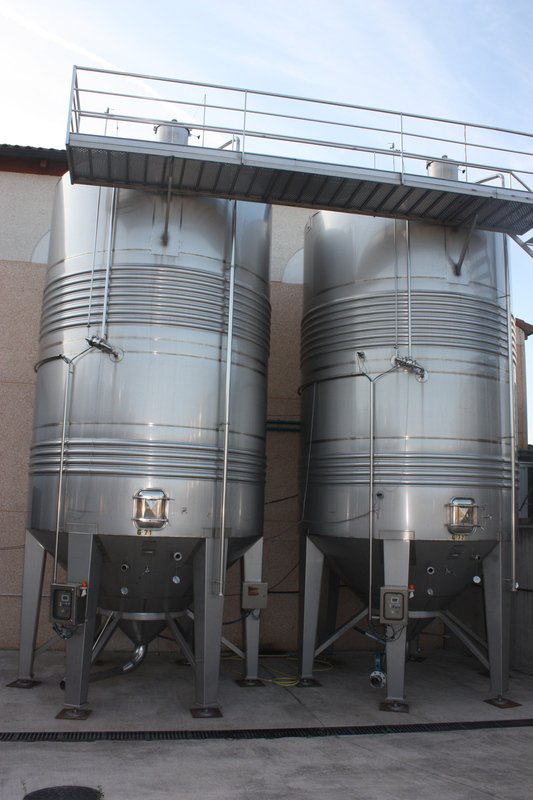 While a few other Spanish wineries use this technology, only two are in Rioja – Bodegas Montecillo and the San Asensio cooperative, and these only use it partially. Oscar believes that Italy is at the forefront of winemaking innovation today and that Rioja winemakers still pay too much attention to Bordeaux. A second innovation is the use of peristaltic pumps that work by expansion and contraction like the movement of food through our intestines to transfer the skins and juice from the fermenters to the press where they’re separated, avoiding Oscar’s pet peeve, oxidation. In his words, “the wine is born younger”. A future project is to store the CO2 produced during fermentation in underground tanks for use in the winery to avoid the necessity of buying tanks of gas, another cost-saving device. Oscar criticizes the abuse of fertilizer in Rioja vineyards, which has increased yields but has also caused an increase of potassium and lower acidity in wines. Traditionally, potassium salts are precipitated and removed by cold stabilization, which Oscar feels is hard on the wines. His solution has been to design a machine to lower the level of potassium (he didn’t explain how it worked) to avoid cold stabilization and the addition of acids. “Less expensive and easier on the wines”, Oscar says. Another innovation is debourbage by means of flotation. Instead of siphoning off precipitated sediments by gravity, Bodegas Tobía injects nitrogen gas mixed with a kind of gelatin into the tanks. This causes any sediment to float to the top of the tank where it’s removed. 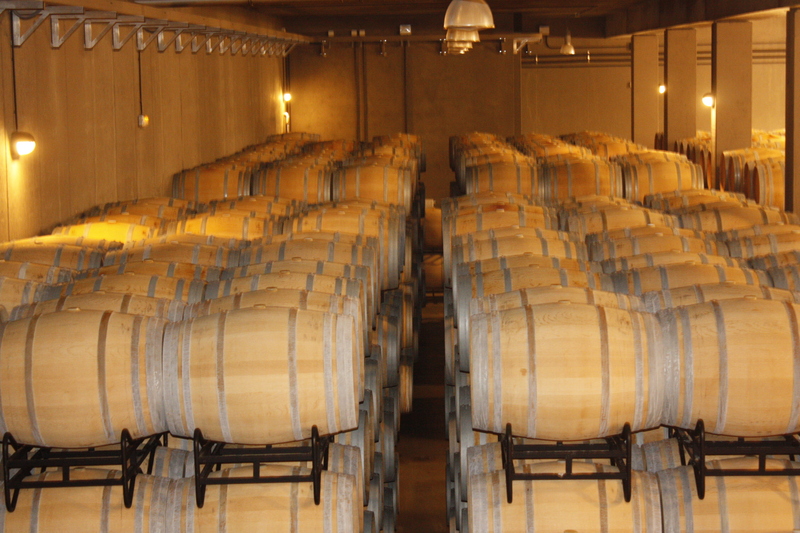 Like other Rioja wineries, Bodegas Tobía uses different kinds of oak: American, French, Hungarian and even Slovak. Unlike other Rioja wineries he experiments with barrels made from wood other than oak, such as ash, cherry, acacia and chestnut in a project with the Murua cooperage and the University of La Rioja. Oscar says that the results are promising and he hopes to release wines aged in these kinds of wood in the near future. 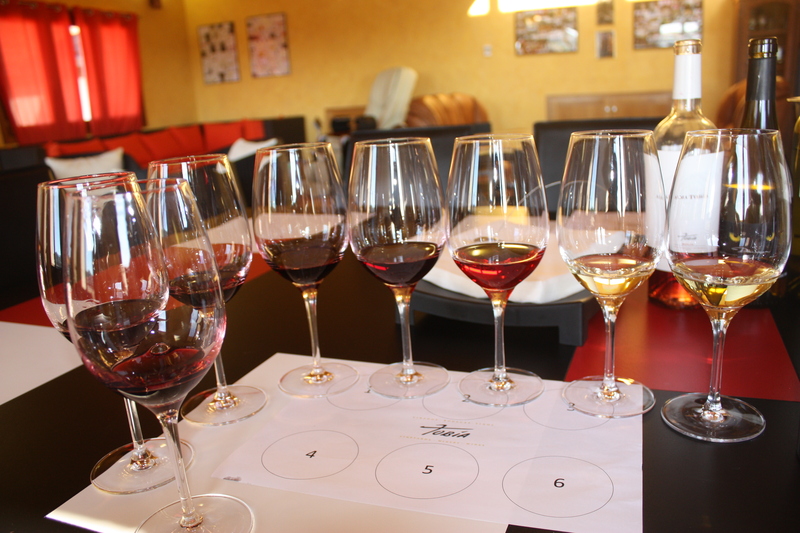 Following the tour of the winery, Oscar offered a tasting of eight of the wines from his wide (but not unmanageable) range. Oscar Tobía white reserva 2009. 50% malvasía, 50% viura with 18 months in French and American oak. Pale yellow; aroma of wildflowers with a subtle touch of well-integrated oak; elegant, almost understated. I liked it a lot. Oscar says he wants to make a wine like the López de Heredia whites, which have taken international markets by storm. Daimon barrel fermented white 2012. 60% viura, 30% malvasía, 10% tempranillo blanco. Pale straw; chamomile and other dried flowers; medium body, just the right acidity. Very good. Alma de Tobía barrel fermented rosé 2013. 55% tempranillo, 35% graciano, 10% “other”. Pretty cherry color; bubble gum and anise; interesting smoky character with oak and strawberries. Daimon barrel fermented red 2012. 56% tempranillo, 22% graciano, 16% garnacha, 6% “other”. Light cherry; strawberries, a hint of oak; crisp acidity with firm tannin, easy to drink but not a simple wine – it has a good backbone. Tobía Selección crianza 2010. 80% tempranillo, 10% graciano, 10% garnacha. Medium ruby; noticeably oaky, smoky, red fruit; lipsmacking, good structure. I thought it had been given too much oak, but otherwise good. Oscar Tobía reserva 2010. 90% tempranillo, 10% graciano. Medium ruby; well-integrated red fruit and oak, herbal, minty; Lovely fruit, perfect acidity and firm tannin. Terrific! Tobía gran reserva 2000. 100% tempranillo. Vinified before the purchase of the Ganimede fermenters. Medium brick; a ‘traditional’ Rioja nose of oak, cedar chest and cloves; silky, good backbone in spite of its age. For me the best wine of the lot. Alma de Tobía 2009. The same blend as the rosé. Deep garnet, almost inky; dark fruit, spicy; really mouth filling, luscious. Definitely a departure from the previous reds. Oscar said it had some ‘experimental grapes starting with an “m’’ from a vineyard in one of the highest vineyards in Rioja Alta. I enjoyed all of Oscar’s wines, although in my opinion, the Tobía Selección 2010 was overoaked and not quite up to the standard of the others. Oscar uses his barrels for five years and all of his reds undergo malo in barrel. For Alma de Tobía he uses French oak, for Oscar Tobía, one year old French, Hungarian and new American oak. His crianzas are aged in one year old wood from several origins and his graciano (which we didn’t taste), in Hungarian oak. Oscar feels that Hungarian oak respects the original fruit profile of the unaged wines better than the others but it’s expensive, almost as much so as French oak. He is placing a bet on sauvignon blanc among the new varieties approved by the Rioja Regulatory Council and malvasía among the current varieties. He recently stated in a white wine supplement in our local newspaper LA RIOJA, “Sauvignon blanc is very elegant and blends well with Riojan varietals. Malvasía hasn’t been very popular but it offers numerous possibilities”. Oscar sells a high percentage of his wines abroad, so keep an eye out for them.